Can crushers offer a convenient, wall-mounted means of compacting aluminum cans (Source). Whether you're compacting for practicality or profit, these hand-powered crushers generally compact 12 or 16 oz cans down to about an inch in size (Source). All of these can crushers we examined do one can at a time, except for the Can Ram, which can handle 10 at a time. For the most part, all of them handle 12 or 16 oz cans, with mixed results reported for cans that are either smaller or taller than that. If you want to crush hundreds of cans at a time, check out the Commercial Zone CanPactor- it can handle 400 12 oz cans at a time. The Crusher is marketed as an efficient compactor for 12 & 16 oz cans to reduce them to about 1" in size. It's a 16", steel-built option with an easy-grab handle. Buyers we spoke with endorsed it as a solidly built crusher that has withstood thousands of can crushes. Just be careful to mount it to a stud in the wall and avoid raising the handle too high and potentially denting your wall. If you use it a lot, you might want to wear safety gloves to avoid getting blisters on the edges of your hands. If you are looking for a top-rated can crusher, you might want to consider this one offered by Basic Industries International. Users love the performance of this item, but some do complain about several design flaws. This product is a sturdy all-steel aluminum can crusher with an easy-to-grab handle that makes it easy to operate. It instantly crushes all 12- and 16-ounce cans to about 1 inch. The Pacific Precision can crusher measures approximately 16 inches and you can hang it on a wall. This can compactor seems like a good choice if you are looking fora great space-saving tool. The general user consensus concerning the Basic Industries International can compactor is that it is very well-built and is an excellent deal for the price. As one happy buyer shares, the product is very durable, stating that he has crushed thousands of cans over the years and yet the product is as good as new. He adds that this aluminum can compactor also crushes cans completely flat (which most others don’t do) which saves a lot of space when storing and collecting crushed cans. However, some buyers complain about several design flaws. First, the depth of the crushing box which needs to be 1/2 to 3/4 inch deeper to contain the cans better. Second, the base itself is not flat. Third, the leverage of the handle is not so good. And finally, if the hand hold was flared about an inch wider, the purchasers agree, it would be more comfortable. This can ram offered by Dial is a solid option if you are looking for a can crusher that holds multiple cans at a time. Users like the functionality of this can compactor, but do complain about certain performance issues. This product can hold 10 cans at a time and it conveniently crushes 5 bags of cans into 1 bag for easy disposal or recycling. The item requires no electricity or batteries and will not rust or cause paint chipping. This aluminum can crusher might be a solid choice for someone who needs to quickly and safely crush many cans all at once. In general, users have a favorable opinion of the Dial multiple can crusher.What they praise is that the product is fast, efficient, strong, able to crush cans to a very small profile, as well as easy to mount and assemble. As one online reviewer shares, large lever arm makes for easy crushing, cans drop at the bottom into a bucket or bag of your choice and the item can crush a 16ozcan too, if done singularly. However, some purchasers complain about several issues, such as that the storage bin is a bit small and flimsy and made completely of plastic. Other complaints regard the fact that cans can get jammed up or pop up if there aren’t enough cans in the item. This can crusher offered by Pit Bull is a solid option for those who need a compactor for 12oz cans. Users like that the product does its job, but some do complain about the doubtful quality. This product recycles aluminum soda, pop, and beer cans by compressing them to approximately 20% of their original size. It is safe and reliable and can be mounted to any solid surface, such as a wall or a table. If you are looking for an environment-friendly tool, this might be a solid option. In general, users have a favorable opinion of the Pit Bull can crusher and they state that it is sturdy and well-made and that it works great. However,some purchasers complain about it being flimsy, as well as about the doubtful quality. One dissatisfied buyer says that it feels really fragile by the touch. Another one states that it doesn’t fit all 12oz cans. Another one shares that the bottom piece started to deform and bend down, which caused the cans to occasionally pop out. 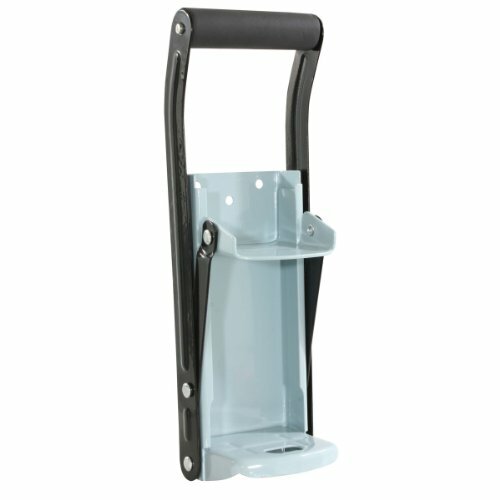 This can crusher offered by Buffalo Tools is a solid option for those who need a can compactor. Users like the functionality of this can crusher, but some do complain about the performance and cheap design. This product features a heavy gauge steel plate construction, a large cushion grip handle and a built-in bottle opener. 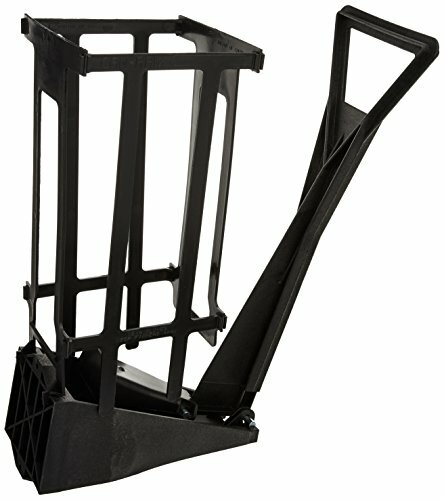 You can mount it vertically with 4 included wood screws.This deluxe can crusher could be a solid choice if you want to save room in your garbage or recycling bin. In general, buyers have a positive opinion of this can compactor. They state that it is sturdy, a good value for the price and works exactly as it should. In addition, users say that it compacts cans down to about 1 inch in height and pulling the lever down to crush a can takes minimum effort. However, there are complaints regarding the cheap metal design and the fact that it doesn’t fit cans larger than standard 12oz can(or 8.3 oz Red Bull size). One dissatisfied buyer complains that it gets wobbly after a while. Another one shares that the product gets stuck a lot, which is why he has to force it down. If you are looking for a soda and beer cans crusher, you might want to consider this can compactor offered by Dpnamron. Users like the functionality of this item, but some do complain about the poor quality. This product can be used for crushing 12oz and 16oz aluminum cans. It features a heavy 16-gauge steel frame.If you are looking for away to recycle cans fast and easy, this might be a solid option. In general, users say that the Dpnamron can crusher is sturdy and a good value for the price. They state that it does the job quickly and neatly. However, some purchasers complain about the poor quality material. Many buyers complain about it being flimsy and wobbling from side to side a little. One online reviewer complains that it tends to get stuck when pulling down and pulling back up. Kind like coin sorters, these tools can help you turn spare junk into cold, hard cash! The first aluminum can compactor we examined is the specific precision option- it's marketed as an efficient way to streamline the recycling process. Pro Tip: If you have a ton of these crushed cans to get rid of and recycle, you might want to consider hiring a waste management service (Source). The way it works, all you have to do is hold and pull down the soda can crusher's handle and it will crush the can- since it usually hangs on the wall it's pretty convenient to use in a pinch. Pacific Precision says that it will crush cans down to about an inch tall- this makes it easier to transport hundreds of aluminum cans to scrap recycling centers. 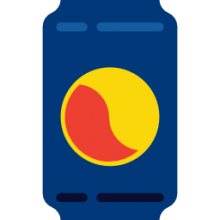 Buyers say that it is best for smaller cans-particularly 16-ounce cans and 12-ounce cans, as opposed to 24-ounce cans. One buyer we spoke with has crushed over 2,000 beer & soda cans saying that it is a simple device that when securely wall-mounted provides an effective means of compacting aluminum can products. Indeed, buyers say it's best to use nuts, washers, and bolts to ensure that it's completely secured to a solid wall surface. You can also lubricate it with WD-40 or a Crisco type of shortening paste to ensure that it's moving parts are lubricated. The second aluminum pop can crusher we examined is the Can Ram. It can handle 10 pop cans at a time and is a manually powered option that makes it easy to dispose of a bunch of wet, sharp-edged beer cans all at once for convenient disposal. It ships with mounting hardware and is best for 16-ounce and 12-ounce drinking cans. One buyer was relatively pleased with his purchase- he says that for curbside recycling purposes being able to deal with multiple cans at a time make it a faster and simpler process. It was pretty easy to assemble, attach to his garage wall, and the actual can compaction process doesn't require a ton of strength- even his kids are able to do it. On the downside, he does is criticize the plastic construction, the relatively small storage bin and says that sometimes the cans can get logjammed when you're doing a bunch at a time. Indeed, another buyer says that this plastic can crusher is too weak compared to steel-built models and doesn't compact the cans as easily or as effectively as stronger, more commercial-grade options do. On the other hand, some buyers defend this product saying that it's not really plastic- it's actually a type of heavy-duty reinforced nylon and if you don't overload it it works pretty well. The third option we examine is the Pitbull can crusher- it comes in 12 and 16-ounce crushing options and is marketed as an environmentally friendly option that can be mounted on the walls or tables. They emphasize that it's able to deal with soda and beer cans and can crush them down to about 20% of the original size. Buyer who've been using it for a number of years to deal with Heineken beer cans tells us that it's a good option if you don't have a lot of space, it's a hassle to get to the recycling center, and if you're comfortable routinely cleaning up the area around the can crusher of the spilled, sticky liquids. Some buyers complain that over time the unit begins to bend and deform, meaning that the compaction process can malfunction. 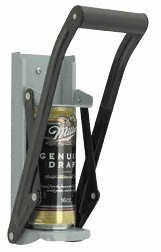 The fourth option we took a look at was the Buffalo Tools can crusher- it's built from steel plate with a cushioned grip handle and an integrated bottle opener that mounts vertically on walls. It doesn't work with anything larger than a 12-ounce can, which means that some buyers have had to resort to manually stamping or hammering cans larger than 12 ounces. One buyer says that after crushing several thousand cans he can attest to its durability, saying that for such an inexpensive price it's delivered and net positive ROI. The last option we examined is the Dpnamron- it can handle 12-ounce and 16-ounce cans, ships with mounting hardware for wall mounts with some buyers saying that you can even deal with 8-ounce cans. Buyers say that it is simple to assemble, although you should be especially careful to attach it to a stud in the wall otherwise you might rip it out when you are crushing. Yet other buyers have complained that it's broken down after limited use and because of the lack structural integrity in the handle can painfully pinch you.